Micromatic LLC | Fluid Power, Inc.
Micromatic LLC. 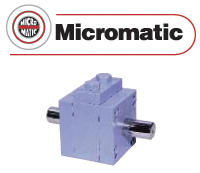 offers rotary actuators with either pneumatic or hydraulic capability. Their special line of engineered rotary vane-type hydraulic actuators offers very high torque in a small package, benefiting from their core skills in manufacturing precision components. Renowned by the names Rotac® and Hyd-ro-ac®, their actuators are used in a broad range of industrial applications throughout the world, from transportation, freight handling, and automation to food processing and medical equipment. We encourage you to contact your Fluid Power, Inc. hydraulic & pneumatic specialists for more information on these rotary actuators, and our other offering of actuator products and solutions for challenging environments.